Home bones dexter patch pre summer countdown reads Reviews summer Pre-Summer Countdown: Get ready! When the New Year comes, summer seems so far away. We continue to autopilot our way through the semester. Suddenly, you have few more finals here and a dreaded paper there. Then, school’s out for the long awaited summer. Now that we’re (basically) adults, summer really means work, work, and attempting to have fun. But, ultimately having to get up early in the morning so…more work. We may have to work like adults but, we definitely don’t have to read like 'em. 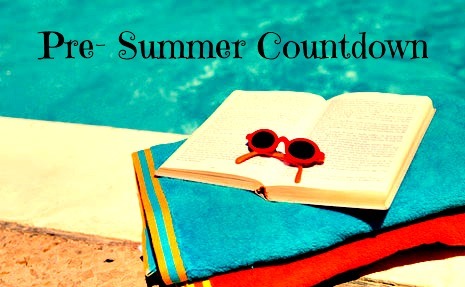 So, we present to you a countdown full of light-weight, carefree summer reads. Can’t make it to the beach? Travel to exotic places without leaving your backyard. Don’t have time to score a summer romance? We have a quick solution to that too. It’s called book boyfriends. For the next two weeks, GLIW will post mini- reviews for our favorite summer reads each day. If you have sunny day favorites, let us know. Let’s make this summer a sit by the pool extravaganza.